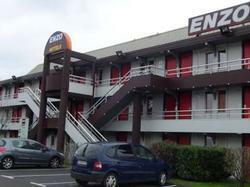 Enzo Hôtels (ex Première Classe Roissy?Goussainville) features double and triple rooms equipped with en suite bathrooms with a shower, satellite TV and free Wi-Fi internet access. An automatic bank card payment system allows for round the clock check-in and check-out. It is situated 15 minutes from Roissy Charles de Gaulle and Le Bourget airports, just 26 km from the centre of Paris. Breakfast is served daily in the breakfast room and a vending machine with snacks and hot and cold drinks can be found near reception. The reception is open from 06:30 to 11:00 and 17:00 to 21:00 on weekdays, and from 07:00 to 11:00 and 17:00 to 21:00 on weekends and public holidays. If you plan on arriving outside the opening hours, please contact the hotel directly. The telephone number is indicated on the confirmation of reservation. En suite room with a shower, satellite and cable TV and free Wi-Fi internet access.